If you wish to support the work of Bera and Mirjana in any way, please get in touch with the TEN office. Dusan Beredi, has been the leading pastor of Protestant Christian Fellowship Novi Sad since January 2013, when Daniel and Vera Kuranji ‘passed the baton’ to him. He came to Christ when he was 20 and was healed from alcoholism. Protestant Christian Fellowship Novi Sad is a church that seeks to be relevant to the local community and to respond to needs of people in Serbia. The church used to work with war refugees but now many other ministries are developed: Rehabilitation Center for heroin addicts, Christian Scouts (Royal Rangers), New Stream (programme connecting Christianity and arts). The goal is to help people in need, but also to point people to Jesus Christ. 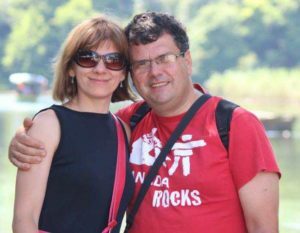 Bera, and his wife Mirjana, have been the national co-ordinators for the Alpha course in Serbia for many years. The course has been supported by TEN from the beginning, alongside Alpha in the West Balkans. Bera is also a professor on Protestant Theologian Seminary in Novi Sad, lecturing on Mentoring, Biblical Leadership and Pastoral Epistles; he is also a National leader for Christian scouts ministry – the Royal Rangers. Pray for the Protestant Christian Fellowship Novi Sad church and its ministry to the city. Pray for divine protection of Bera and Mirjana and their family. Pray that the proclamation of the good news of Jesus Christ will find open hearts.